PHOTO TIME - Tony (center, on barrel), played by T. Doyle Levertt, poses as his picture is taken during the second scene of "The Most Happy Fella." Photo by Troy Fedderson/University Communications. 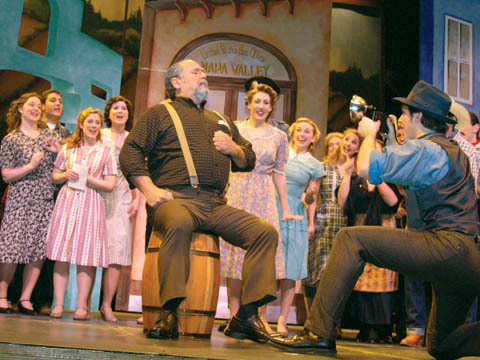 The big voices of "The Most Happy Fella" struck a chord with Ariel Bybee. The Institute of Agriculture and Natural Resources at UNL annually returns at least $15 in benefits to Nebraskans for every dollar of state support, making it "a primary engine for economic and social sustainability," a new study says. The university has established a new state transportation center to better coordinate and fund transportation research and to strengthen the state's economy and infrastructures of the future. A group of 3-year-olds are digging their weekly visits to UNL. Tom Osborne enjoyed representing Nebraska - but something was missing in Washington. Paul Barnes, associate professor of piano and co-chair of the piano area in the School of Music, will perform and teach in China and South Korea March 5-21 as part of a sabbatical project. FROZEN EMOTION - (Top) Jennifer Young, a UNL communications studies major from Omaha, and her brother, Teddy Young of Wayne State College, perform as mimes during the Feb. 16 Gospel Extravaganza at Pershing Center. The Gospel Extravaganza, part of the 30th annual Big 12 Conference on Black Student Government hosted by UNL Feb. 15-18, included a number of acts, including singing by (bottom) Toyin Alabi of Lincoln. Comic book artist Chris Ware (second from left) reacts to a question from Aaron Coleman (far right), assistant Web developer with University Communications, during the Feb. 16 artist talk and reception for Sheldon Memorial Art Gallery exhibitions "Comic Art from the Permanent Collection" and "Chris Ware." Both exhibitions are open through April 29. Photo by Tom White/Sheldon Memorial Art Gallery. The Van Brunt Visitors Center will host a multi-discipline celebration of graduate student work from 10 a.m. to 2 p.m. March 2. The event is free and open to the public. The Lux Center for the Arts will host two textile exhibitions in conjunction with the International Quilt Study Center's third biennial symposium. The Haydon Art Center will host the American premier of the exhibit, "European Art Quilts IV," March 1-24. The exhibit coincides with the International Quilt Study Center's symposium, "Traditions and Trajectories: Education and the Quiltmaker," March 1-3. The five-time Tony Award-winning musical, "Man of La Mancha" plays the Lied Center for Performing Arts on March 2. The Chieftains, a traditional Irish music group, will perform at 7:30 p.m. March 1 at the Lied Center for Performing Arts. Academy Award-winning producer Chris Donahue will screen and discuss his latest documentary, "Be Good, Smile Pretty," at 7 p.m. Feb. 22 at the Mary Riepma Ross Media Arts Center. The path of food - from field to dinner table - is traced in Nickolaus Geyrhalter's documentary, "Our Daily Bread," opening Feb. 23 at the Mary Riepma Ross Media Arts Center. The 19th annual Undergraduate Art Competition is Feb. 26 to March 22 at the EisentragerHoward Gallery in Richards Hall. My maternal grandparents got their drinking water from a well in the yard, and my disabled uncle carried it sloshing to the house, one bucket of hard red water early every morning. I couldn't resist sharing this lovely little poem by Minnesota poet, Sharon Chmielarz.